If you find the warm summery weather is putting you in the mood for some light fish dishes from the Mediterranean, you are not alone. I too found myself dreaming of such delights yesterday. This is a quick and simple dish and when you make it you will be so glad you did as the smells in your house with this in your oven will simply be out of this world. The onions end up yielding this sweetness, and together with the fennel taste almost jammy. There really are some beautiful flavors in there, I urge you to dry this dish out, you will be so happy you did! For this dish it is imperative that you choose the most beautiful freshest fish you can find. There should be no fishy smell, it should smell of the ocean. Red mullet is really nice for this but you can use sea bream or red snapped as I did, just make sure your fish has been gutted and scaled at the fishmongers. You could use smaller individual sized fish for each person if you like. 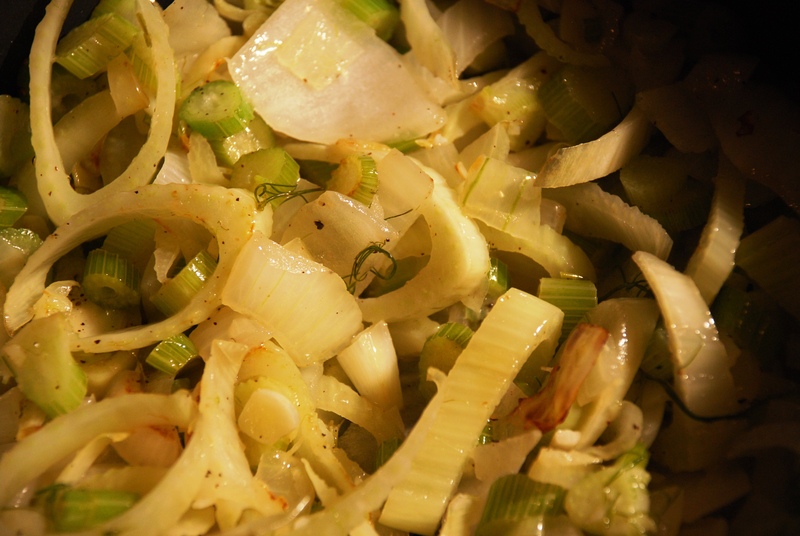 Heat the butter and olive oil in a large frying pan, add the garlic, onions and the fennel. Cook on med to low heat till fennel is soft but don't let it brown. Season to taste. 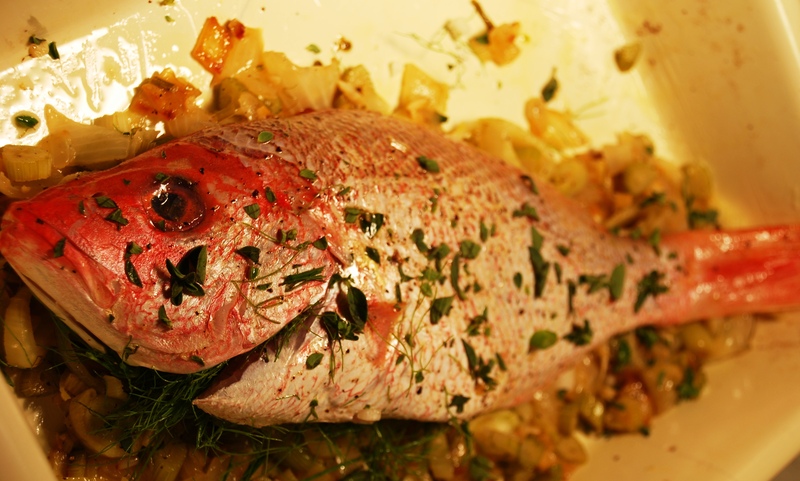 Stuff the cavity of your fish with 2-3 tablespoons of the fennel mixture and the green leafy parts of the fennel. Rub your fish with olive oil (please use good olive oil) and squeeze your lemon on top of the fish, season well with salt and pepper. Grease your baking dish and put the remaining fennel mix on in the dish and sprinkle with 1/4 tsp oregano. Now place your fish on top of this fennel mixture and sprinkle the other half of the oregano on top. Bake in the oven for 25-35 minutes, or till just cooked. Garnish with lemon wedges and serve with some nice summery salads.